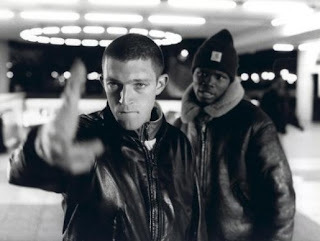 Although "La Haine" feels so thoroughly relevant and modern, the film is almost 15 years old, made at the time of “Boyz in the Hood” and “Menace II Society”. “La Haine” is less a time capsule of the era, like those urban American films, and more a grand artistic statement comparable to the early work of Martin Scorsese, Spike Lee and Vincent Gallo. Kassovitz follows the day in the life of three low level street hoods, Vinz (Vincent Cassel), Hubert (Hubert Kounde), Said (Saïd Taghmaoui). It's just after a violent riot in Paris, which saw one of the leaders of their community beaten and in the hospital. Anger, fear and frustration fills the air, and the three boys are not sure how to channel their anger. When hotheaded Vinz (think Johnny Boy from "Mean Streets") finds a missing policeman's gun on the ground it becomes a symbol for Vinz to exercise the power and force he's always wanted. For Hubert, he seeks an escape from the ghetto so he doesn't suffer the same fate as his imprisoned brother. And for Said, he's left in between the two divergent paths of Vinz and Hubert. We just spend one day with the guys as they cruise the streets of Paris rambunctiously disturbing the peace while contemplating their futures in the Paris ghetto. I don’t know anything about urban Parisian life other than what I see in the movies and read on the news. Between now and then it would appear that little has changed for the underprivileged youth of Paris – a mixture of races who, through their urban poverty and racial discrimination, congregate together in gangs for strength. This is the story of any major ethnically diverse urban centre be it the streets of South Central LA or Toronto. But the trio in this film are not defined by race, Hubert is black, Vinz is Jewish-White and Said is Muslim, three lost souls who have little in common culturally other than their mutual poverty. It wasn’t the first and won’t be the last film on this subject but “La Haine” is one of the powerful and accessible of these urban stories. Though this wasn’t Mathieu Kassovitz’s first film, it certainly was his coming out party. Shot in stark high contrast wide angle black & white, “La Haine” is a beautiful piece of celluloid. Black & white captures youth so eloquently and the deep focus look in this film reminds us of Francis Coppola’s “Rumble Fish”, or Peter Bogdanovich’s “The Last Picture Show”. So far I’ve referenced five great filmmakers, so there’s a palpable acknowledgement of cinema in Kassovitz’s style. He’s supremely confident with his camera and the direction of his performances. Characters are framed carefully with attention-grabbing compositions – whether it’s the back of someone’s head, or a bold macro close-up Kassovitz finds clever ways to orchestrate the characters in the spaces - an expressionism borrowing heavily from Spike Lee and Martin Scorsese. Despite the stylish visuals, Kassovitz's compensates with a natural freeform narrative which evolves without burdening us with traditional plot devices. Using the time of day as the only narrative reference point, Kassovitz makes every scene special. And when the final scene comes only then do we realize how well his characters have been drawn and made flesh. In the final moments Hubert, Vinz and Said are tested in a dramatic confrontation which leaves the audience gasping - and with a little bit of auteur ambiguity for good measure to let us all know it's a director's film. Enjoy.